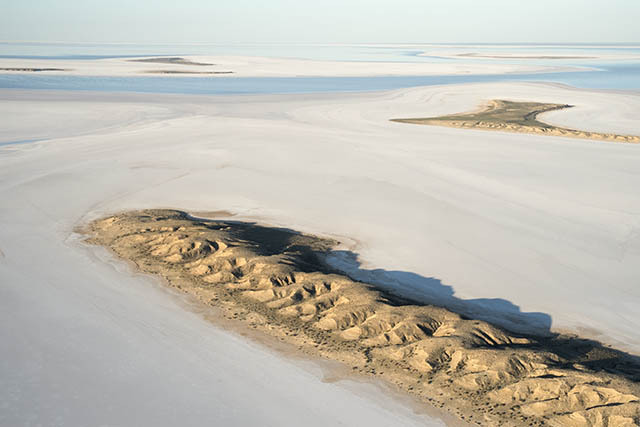 Here’s further evidence of the whiteness, the brilliance of the salt on Lake Frome in South Australia’s far north, particularly when it is dry. Pilots of aircraft flying low near the surface of the lake are likely to experience a phenomenon usually associated with the Antarctic or Arctic where the horizon becomes indistinct because of the large surface area of white. The spectacular dunes, like the one here, are found mostly at the southern end of the lake and they provide landmarks in the salt which covers about 2,500 square kilometres.